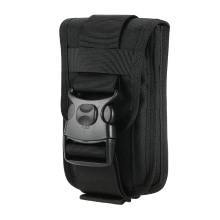 This molle pouch is practical and multi-functional. Made of durable and water resistant nylon fabric, the bag works as waist pouch or molle attached pouch for molle-compatible backpack. It will store and organize your smart phone, keys, cosmetics, cards, cashes and other small personal belongings well when you are on traveling or outdoor hiking, camping, climbing, cycling etc. This molle pouch have a molle system on back, you can use it with other molle bag, backpack etc. Great organizer for wallet, phone, cards, tool and Power Bank etc. 1000D Nylon fabric, wear-resisting and lightweight. Suitable for outdoor sports, hiking, climbing, camping and mountaineering.